Updated, 7:49 p.m. The technical issue has been resolved, according to Paul Gauguin Cruises. The ship sailed from Bora Bora yesterday afternoon and arrived at Motu Mahana (off the coast of Taha’a) this morning as scheduled. The rest of the itinerary remains as originally scheduled with the ship sailing at 5:00 p.m. today to Moorea to arrive Thursday morning. 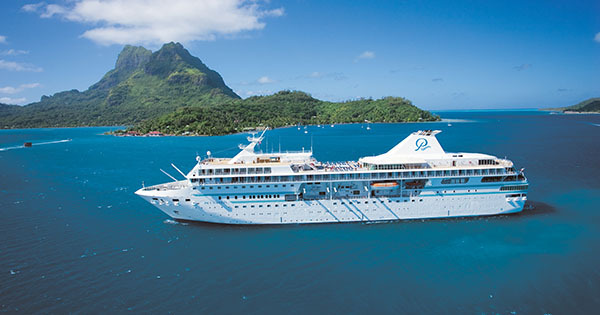 Paul Gauguin will then overnight in Moorea and depart Friday at 5:00 p.m. for a 7:30 p.m. arrival into Papeete, Tahiti, on August 19, with the cruise concluding the next day. As compensation, the line will provide guests a refund of 30% of the cruise fare paid and a US$1,000 future cruise credit. (3:50 p.m. EDT) -- The cruise ship Paul Gauguin has been stuck in Bora Bora for the past several days because of a propulsion issue, which interrupted its Society Island itinerary but didn't affect ship services for passengers. The issue is due to electronic cards related to the propulsion system, the company said in a statement. A service engineer from France is joining Paul Gauguin today; the vessel is expected to sail on its original itinerary later today. During the wait, the ship has been running tender service to and from Vaitape, as well as to the line's private beach, the line said. The company has also arranged more shore excursions and provided a complimentary one for each passenger. Once the ship gets going, it will go to Taha'a (Motu Mahana), Paul Gauguin Cruises' private island off the coast of Taha'a. It is slated to arrive Wednesday morning to spend the day before departing for Moorea at 5 p.m. The ship will be in Moorea Thursday and Friday before departing for Papeete, Tahiti, on August 19. It is expected to arrive at 7:30 p.m. and to overnight as scheduled. The cruise concludes on August 20. Skipped ports include Rangiroa and Fakarava on Tuamotus. The company says it will announce a compensation plan for passengers after the technical issue is resolved and the total impact on the itinerary has been determined.